With its capital-intensive equipment, strict temperature requirements, and energy dependence, cold chain logistics has always been a demanding segment. Now the sector is grappling with additional challenges—from increases in the sensitivity, quality standards, and volume of many of its goods, to continually mounting regulations. The cold chain also faces many of the same issues challenging the entire supply chain: serving the global market, driving out costs, becoming more strategic, and addressing capacity and resource constraints, all while managing the exacting needs of the sector’s precious cargo—primarily food and pharmaceutical products. Here are 10 trends impacting cold chain logistics, and some strategies manufacturers and logistics service providers use to adapt and thrive. 1. Cold chain logistics is becoming more global. Increasing interest in healthful food, and a growing middle class in locations such as China, are pushing cold chains to globalize. Consumers now demand higher-end products, such as Alaskan salmon, that must travel extended distances and ship quickly to ensure freshness and quality. “Food is traveling around the world as more manufacturers manage their supply chains globally,” says Doug Harrison, president and CEO of VersaCold, a Vancouver, B.C.-based cold chain logistics, third-party (3PL) provider. These manufacturing plants are becoming more specialized to a specific product or label, and they ship their goods more widely. “Demand for fresh food is growing, and that requires increased innovation to overcome capacity and infrastructure constraints, and mitigate disruption risks to ensure quality delivery,” adds Tim Smith, executive vice president, sales and business development, for Lineage Logistics, a cold chain 3PL based in Colton, Calif. Meeting these demands without driving up inventory or cost places added pressure on each element of the supply chain. In pharmaceuticals, added product specialization and sensitivity means they are more often being shipped globally to reach their markets. Logistics practices must comply with each country’s regulations and maintain the strictest requirements, driving many drug makers to raise practices across their supply chain. 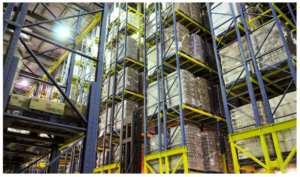 “Many shippers are concerned about maintaining control of products in transit,” says Jeff Luthman, vice president, life science solutions, for Indianapolis 3PL MD Logistics. 2. An increasing focus on quality and product sensitivity. In the food industry, the big trend is an increased focus on quality, health, and integrity. To win the repeat business of fickle and demanding consumers, manufacturers must ensure an optimal experience with the brand. For cold chain products, that means avoiding the changes in texture and taste that occur when a shipment strays outside recommended temperatures, as well as decreasing the amount of processing for proteins such as fish. “More premium products are coming into the market with a shorter shelf life, greater sensitivity to temperature, and a much different level of demand,” says Harrison. This intensified focus on quality and the consumer experience means refrigerated warehouses across the food cold chain must maintain as many as five different temperature zones. Pharmaceutical manufacturers, too, are dealing with more sensitive products, such as customized treatments for rare diseases. These products often include more high-value active ingredients that offer shorter shelf lives and carry strict temperature requirements. Many drugs must be maintained at temperatures lower than 77 degrees F, while some require 35 to 46 degree cold chain logistics transportation. Another fast-growing drug category is controlled room temperature. These drugs are safe at room temperature, but must be maintained there during transport using temperature-assured containers, such as reefers, to avoid the spikes that can come in ambient containers. 3. Regulation is on the rise. Globalization and an increase in the number of food safety and pharma counterfeit incidents are prompting governments to tighten regulations on production and supply chains. Establishing preventive measures and harmonizing regulations are major issues for the food and pharma industries. For years, pharmaceutical mandates in most countries required products to be maintained within manufacturer-established guidelines only in storage. But in November 2013, the European Union (EU) guidelines on Good Distribution Practice for medicinal products for human use went into effect, extending temperature requirements to transportation, and expanding coverage to include over-the-counter drugs. In the EU, about 80 percent of pharma products now require temperature-controlled transportation. Anticipating similar regulations in the United States—and considering the potential for exporting these drugs—many pharmaceutical manufacturers are adopting this approach in the United States, too. The phasing-in of rules stemming from the U.S. Food and Drug Administration’s prevention-focused Food Safety Modernization Act, passed in 2011, is triggering investment in solutions to document every step in the food supply chain. Products such as produce must be traceable all the way back to the point of origin. Recall systems must be reliable and efficient, not only to rapidly comply with more stringent regulations, but to limit the scope by isolating specific batches of product. Getting out ahead of such regulation is a common theme across cold chain logistics. Manufacturers are building more stringent practices into their requirements, and many cold chain 3PL providers are investing in additional credentials. Atlanta-based cold chain 3PL Americold, for example, plans to have 14 sites certified by the Safe Quality Food Initiative by the end of 2015, and Lineage Logistics is aiming for certification across all of its business units by 2020. 4. Market pressures drive demand for supply chain efficiency. The need to operate a Lean supply chain is even more acutely felt when every step faces the additional requirement of refrigeration and compliance. At Nestlé Canada, this has meant corporate-wide adoption of Lean principles, and a more strategic approach to working with supply chain providers, including cold chain. In the past, the company asked suppliers about capabilities and rates. “Now we ask, ‘Are we aligned transactionally on the physical flow of goods? Are we aligned strategically on how we want to operate? Can we work together to accomplish everything we need to? '” Jewell says. Driver shortages and capacity constraints are hitting the cold chain especially hard. Operating a refrigerated fleet requires significant capital investment, specially trained drivers, increased liability, and a greater risk for close inspection. Many of MD Logistics’ customers, for example, require one- or multi-day inspections of a carrier’s equipment to ensure it is in compliance. “It’s challenging to find qualified full truckload carriers in this controlled environment,” notes Luthman. Cold chain operators are eager to find new strategies to reduce costs. In retail, requirements for smaller, more frequent orders are driving the use of multi-cell trailers—refrigerated trailers in which insulated curtains are hung at intervals to create different temperature zones. This approach enables a cold chain 3PL to include frozen and chilled goods in the same shipment. But consolidating into a multi-cell trailer isn’t always possible. Because of the space and handling costs of managing the insulation, it works best for dedicated equipment rather than a common refrigerated carrier. Using multi-cell trailers is “process intensive,” says Jason Deloach, senior director of engineering at Americold, which has received a growing number of RFPs requesting this service. “There must be space on the dock to stage and load product in a temperature-oriented order,” particularly for multi-stop routes. Even if the trailer isn’t full, the strategy still delivers savings over three separate shipments on three appropriately cooled trailers, with the associated labor, DC slots, and waiting times, he adds. 5. Manufacturers are outsourcing more processes to 3PLs. Shipper demand for efficiency, visibility, and product freshness is driving cold chain 3PLs to add a wide range of value-added services. For example, a trend toward case picking drove Americold to invest in new designs and racking systems, along with automation, in its warehouses. That’s easier to justify in facilities built for specific products, such as plant-attached DCs, says Deloach. In its public DCs, the 3PL takes a flexible approach to accommodating the needs of various products and manufacturers. Another service that shippers request is postponing food processing. Products are held in cold chain warehouses, then prepared and packaged for shipment just in time to fulfill specific orders. That might include bringing frozen seafood up to a chilled temperature for processing. “Keeping product ‘white’ — postponing labeling and putting it into true consumer packaging until the delivery destination —generates capital cost and inventory savings,” says Harrison. In addition to domestic retail and food services, shippers increasingly ask Lineage Logistics to prepare proteins for export. One service in demand is high-pressure processing, a post-packaging, non-thermal pasteurization method of killing microorganisms. The process enables companies to use a clean label — one without a long list of preservatives — and extend shelf life. One cold chain service on the horizon is an X-ray of product packages to ensure safety and accuracy prior to export, a service Lineage is discussing with some customers. 6. Cold Chain Logistics is experiencing some mode shifting. Fuel price fluctuations and globalization have driven some cold chain operators to shift modes from truckload to intermodal, or from air to ocean. Other factors contributing to mode shift include truck driver and capacity shortages, and sustainability initiatives. But makers of chilled and frozen goods must balance the additional time these modes may take with speed-to-market requirements. While air is the predominant choice for pharma transport, some shippers have shifted to steamship as the ability to manage and track locations and temperatures in containers has improved. But unlike over-the-road, where a qualified carrier repeatedly uses the same trailers for the same customers, “once the container is offloaded and returned to the steamship line, there is no guarantee it will be used again” for that manufacturer’s shipments, notes Luthman. This makes it challenging for the 3PL to inspect and qualify containers. 7. Sustainability initiatives are driving investment. Cold chain operators are looking for new ways to balance the energy-intensive requirements of perishable products with the desire to reduce resource consumption. Americold, for example, works with utility companies, and closely monitors power consumption and calculated CO2 equivalent emissions for its facilities. Reading, Pa.-based 3PL Penske Logistics is testing compressed natural gas (CNG) for tractors with customers including Wegmans and Kroger. Other service providers are using electric vehicles, especially for drayage. But refrigerant is a more challenging obstacle than fuel. In warehouses, operators including VersaCold have shifted from freon to ammonia, but the compound’s volatile properties make it unsuitable for trailers. “Using CNG on the trailer side is still in its infancy,” says Mark Smith, area vice president at Penske Logistics. 8. Packaging is evolving to meet new needs. For pharmaceutical manufacturers, a big challenge comes in balancing packaging and transportation costs, says MD Logistics’ Luthman. For small parcels moving through the ambient supply chain, the 3PL can choose 24-, 48- or 72-hour packaging, but the more insulated the package, the higher the cost. It’s also essential—especially for international shipments—to have partners who can ensure shipments are re-iced if a delay occurs. Food manufacturers are turning to newer disposable packaging designs to ensure integrity for more sensitive products. Reusable containers are also seeing increased use in both food and pharmaceutical logistics to reduce waste, and some companies are embracing greener packaging materials. 9. Technology investment remains critical. Like all supply chains, cold chain operators must continually upgrade technology to ensure efficiency, integrity, and safety. This includes both back-end IT infrastructure and front-end devices to gather and report key shipment data in real time. Cold chain operators have invested considerably in on-board equipment built into refrigeration units to track temperature and location, and to make this data available to 3PLs and shippers in real time, offering increased visibility and the opportunity to prevent or mitigate loss. Some shippers use removable sensors to independently track the temperature of their cold cargo, usually for high-value goods and international shipments. Some food manufacturers have built this capability right into their packaging. MillerCoors, for example, uses temperature-sensitive ink to show when products are at optimal temperature. These inks are also used on milk cartons to indicate the temperature has fallen out of safe range. Nestlé Canada uses GPS-enabled sensors on inbound ocean, rail, and truck freight. The devices include real-time alarms for zone, route, intrusion, and temperature. “When importing, it’s critical to know the product’s location, safety, and quality,” says Jewell. This rise in demand for real-time temperature and location status is sharply driving demand for IT infrastructure that can analyze and deliver data where and when it’s needed. That infrastructure will be further challenged in pharmaceutical logistics as serialization regulations take hold in 2017, requiring tracking of all serial numbers in a shipment down to the unit level. “The serialization element will affect cold chain logistics, not only marking the integrity of the product, but requiring 100-percent accuracy with information flow to the customer so products don’t spoil,” says Luthman. While serialization will provide benefits, it will also add complexity and cost to the supply chain, he notes. 10. Customer habits persist as the cold chain’s weakest link. The biggest obstacle for many cold chain operators is the one part of the supply chain they don’t control: The moment products are placed in the consumer’s shopping cart or tendered to a healthcare provider. Despite considerable expense and effort to move the item across hundreds of miles through multiple hand-offs, a product that sits too long in a cart, a hot car, or a poorly regulated freezer can degrade in quality, a condition that often gets blamed on the manufacturer. As part of its Lean initiative, Nestlé Canada conducted research on how consumers perceive value for brands such as Drumstick and Parlour ice cream, including how open they might be to paying more for packaging that offers additional insulation. Ensuring pharmaceuticals, food, and other chilled goods retain their integrity and safety remains a moving target for cold chain operators. Globalization, tightening regulation, and changing consumer demand continue to alter the scope of the task, while driving the need for technology, efficiency, and security.